Greetings music video lovers far and wide! It’s Andy Gesner and the staff from HIP Video Promo, back with another clip from a Nordic band with global aspirations and a sound to match their worldwide vision. We at HIP continue to be amazed by the international cast of contemporary music: thanks to the Internet, geographic boundaries are no longer impediments to European indie bands with American ambitions. At the beginning of 2007, nobody in the States knew who the Racetrack Babies were. Now, after a highly successful U.S. tour, airplay on American left-of-the-dial stations, and an enthusiastic recommendation from MTV’s Subterranean weblog, the Danish band has won devotees from Atlantic to Pacific. The future couldn’t be brighter. The American shows have left crowds breathless, and sent attendees rushing to their blogs for fevered recaps. But it was the very Nordic clip for “The Storm” that caught the attention of Subterranean. 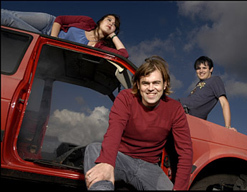 The website compared the video to recent work by the Shout Out Louds and Sigur Ros, and even came up with a plausible appellation for the aesthetic of these bands: “faerie indie”. Director Jesper Isaksen has captured something strange and mystical in his nearly-straightforward performance clip, and presented the Racetrack Babies as a group with command over the natural world. Not for nothing does he shoot them in a forest glade – he wants to suggest that there’s elemental magic in the music they make. Fans of Summer Salt Santiago, their latest album and first Stateside release, won’t need much persuasion. It’s a collection of first-rate indie rock: melodic, moody, enthralling, and radio-ready. Tracks like “The Messenger” and “Racetrack Babies” throb, brood, and swirl, and draw listeners into deep sonic whirlpools. Lead single “The Storm” begins with chiming guitars, a sonorous bass drone, and a whispered vocal, but before long, it’s exploded into a thunderous chorus of uncommon intensity. As always on a Racetrack Babies cut, the guitarwork is impeccable – the members of this talented Scandinavian combo know how to weave together six-string parts, and blend disparate textures into a mesmerizing whole.. The clip for “The Storm” is similarly hypnotic. It’s autumn in the arboreal forest, and Racetrack Babies play on a carpet of colored leaves. Above them hangs a verdant canopy; the trees here have not yet changed. Leaves swirl around the musicians, and wind whips their hair back as they play. But this isn’t any ordinary wind – instead, it appears to be generated by the frontman’s feelings for a mysterious woman of the wood. She rises from a lake, impassive; and walks over fallen branches and tree stumps in the direction of the Racetrack Babies. The closer she gets, the more powerfully the wind blows, and when she stands before the band, they bend as if in a gale. She approaches the frontman, and for a moment, it looks as if they’re about to embrace. But instead she falls at his feet – and he must scoop her up from the glade, and return her limp body to the primeval pool. Here at HIP, we’re becoming ever more aware of the amazing music coming from Denmark, and Racetrack Babies have been no exception. Many thanks to Christian Andersen and Claus Enevoldsen at Musikministeriet for allowing us to bring you this Danish wonder! If you need more info, call Andy Gesner at 732-613-1779 or email us at HIPVideo@aol.com.